This report is based on the most recent and accurate available information at the time of preparation. Given the rapidly changing nature of the incident, readers should be aware of the potential requirement for later confirmation or clarification. • [22 Jul 09] The strategy to remain in a CONTAIN AND PROTECT Phase for an extended period of time has allowed the Torres Strait and Northern Peninsula district to limit the spread of the Pandemic (HINI) 2009 virus, however, as community transmission is now apparent on a number of islands within the area, the district moved from the CONTAIN AND PROTECT Phase to PROTECT at close of business Wednesday, 22 July 2009. • [22 Jul 09] The Australian Department of Foreign Affairs and Trade have advised the border between the Torres Strait and Papua New Guinea will remain closed pending a fmiher visit and review by Papua New Guinea government officials. The next review is expected to take place on Monday, 27 July 2009. • [27 Jul 09] The Cape York HSD are reporting 68 confirmed Pandemic (HtNt) 2009 cases across eight commnnities. To mitigate the impact of the virus on the communities, Queensland Health are nndertaking media activities across the region, and letterbox drops in Weipa and Cooktown communities. • [22 Jul 09] The discrete Indigenous community of Pormpuraaw in Cape York has moved to the PROTECT Phase. Due to an increase of confirmed Pandemic (H IN I) 2009 cases in the community, nursing and Indigenous Health staff are being re-deployed to Pormpuraaw from the wider district. • [22 Jul 09] All other communities within the Cape York HSD remain in the CONTAIN Phase, with sentinel swabbing and ongoing surveillance. • [23 Jul 09] Effective Thursday, 23 July 2009, Mount Isa, Cloncuny and Doomadgee moved from the CONTAIN phase to the PROTECT phase due to increased community transmission of the Pandemic (H I N I) 2009 virus. Other outlying areas of the Mount Isa region remain at the CONTAIN phase. • [23 Jul 09] The first case of Pandemic (HINI) 2009 has been identified in Mornington Island. Contact tracing is being conducted. 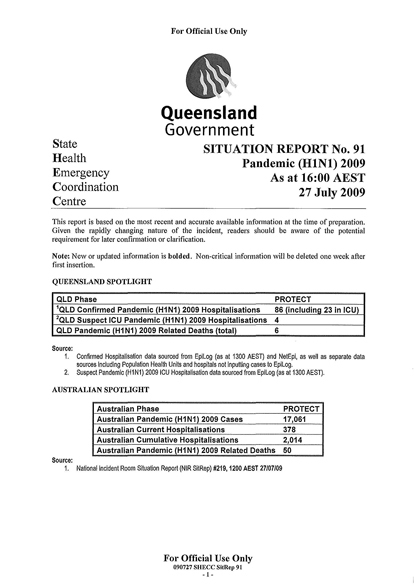 • [26 Jul 09] Queensland has repOlied its sixth Pandemic (HINI) 2009 related death in a 33 year old Brisbane male who was in a vulnerable group and had multiple underlying medical conditions. The man was admitted to hospital on Friday, 17 July 2009, and after spending four days in Intensive Care, died away on Saturday, 25 July 2009. • [24 July 09] On Friday, 24 July 2009, Queensland repOited its fifth Pandemic (HlNI) related death. A man in his 20s died in a Brisbane south-side hospital today. He was in a vulnerable group. No other details will be released. • [23 Jul 09] On Thursday, 23 July 2009, Queensland repOited its fourth Pandemic (HINI) 2009 related death. The patient was an 84 year old male with underlying medical conditions. The man died in Brisbane on Wednesday, 22 July 2009. • [22 Jul 09] A teenager with multiple underlying medical conditions died in Nambour Hospital. The patient tested positive to Pandemic (HINI) 2009 after being admitted on Sunday, 12 July 2009 with respiratory difficulties. • [22 Jul 09] A 70 year old male with multiple co-morbidities who died, Wednesday, 22 July 2009. The patient had been admitted to Townsville Hospital as a cardiology inpatient in the Critical Care Unit and had tested positive to Pandemic (HINI) 2009. 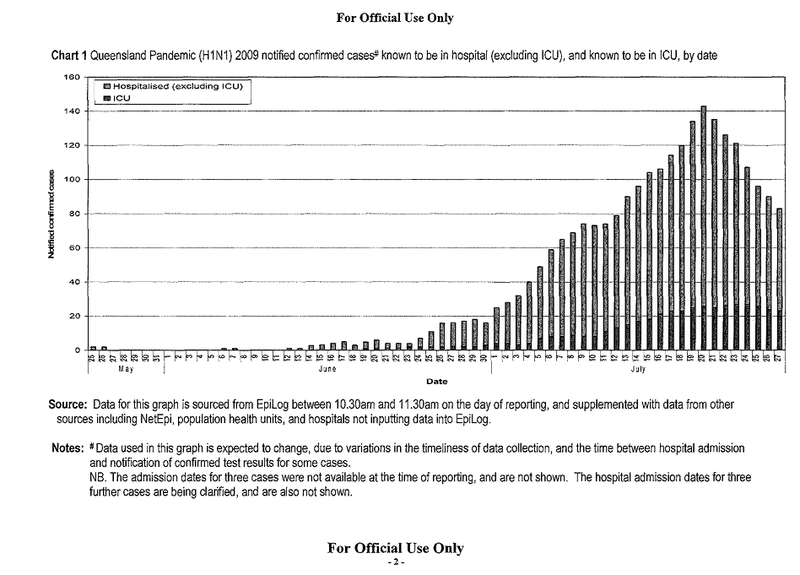 [27 Jul 09] The number of Australian confirmed Pandemic (HINI) 2009 cases reported by the National Incident Room is 17,061. This is an increase of293 cases since the last SHECC SitRep. [23 Jul 09] On Wednesday, 22 July 2009, South Australian Health advised a 56 year old woman had become the third person to die in South Australia after being diagnosed with Pandemic (HINI) 2009. • GP consultation rates have risen sharply over the last week in England. • Under-5s and 5-14 year olds are the age groups predominately affected, with the over 655 continuing to show much lower rates. • The majority of cases continue to be mild. The provisional number of deaths related to swine flu is 26. • HPA estimates that there were 100,000 new cases of swine flu in England last week (range 60,000 – 140,000). [24 JULY 2009] WHO repOlts that he number of human cases of pandemic (HINI) 2009 is still increasing substantially in many countries, even in countries that have already been affected for some time. In most countries the majority of pandemic (HINI) 2009 cases are still occurring in younger people, with the median age repOlted to be 12 to 17 years (based on data from Canada, Chile, Japan, UK and the United States of America). Some reports suggest that persons requiring hospitalization and patients with fatal illness may be slightly older. [24 July 09] The US CDC have repOlted on four children aged between 7 and 17 years who were hospitalised with neurologic complications associated with pandemic (HINl) 2009. All cases have since fully recovered. The CDC repOlt notes that the complications were less severe than those recently described in cases related to seasonal influenza [US CDC MMWR, 24 July 2009].